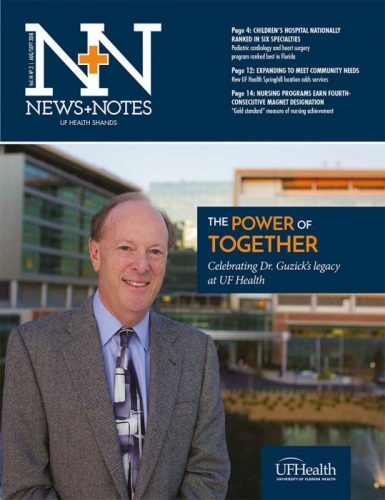 We look for opportunities to better serve patients and share the expertise, innovation and technology here at UF Health with other regional communities. By strengthening relationships with other health systems and providers, patients benefit from our combined resources. Florida’s population is growing and aging. Planning ahead to establish these connections gives us pathways to address future demands for care. How do we do this? Four ways: By expanding and improving referral relationships so patients with complex conditions can access the specialized care we provide at our academic health center. By developing new, shared clinical programs. By introducing graduate medical partnerships that bring College of Medicine physicians into other communities. And by giving patients in other parts of the state more access to our clinical studies and health science research. We can’t solely rely on our stellar reputation and excellent outcomes — that’s not enough. We have to plan carefully to meet Florida’s health needs. Please explain the affiliation agreement between UF Health Shands and Central Florida Health. Central Florida Health includes Leesburg Regional Medical Center and The Villages® Regional Hospital. We get a lot of patients from Central Florida who come to Gainesville for our services. We have a great relationship with Central Florida Health. UF Health provides the full spectrum of stroke care to their patients when they need our expertise and technology. They transfer patients here, we provide vascular neurology consults 24/7 and we provide continuing medical education about stroke care. This new venture allows us to take another step with Central Florida Health to benefit people in Lake, Sumter and Marion counties. We’re looking to create a primary care physician training program at these two hospitals. Primary care doctors are in demand, and they usually establish practices close to where they got their training. We want our graduates to stay at hospitals in our network of affiliates. We train the best-of-the-best doctors and it’s in our best interest to keep them in the family. Central Florida Health currently offers health coverage through their own self-insured program. Now they will be offering incentives for their employees to preferentially use UF Health physicians, hospitals and facilities when they need services that cannot be provided by Central Florida Health. We’re excited to combine our talents and resources and to address industry challenges like ensuring our communities have enough great primary care physicians. We share the same goals as our colleagues at Central Florida Health. We just want to provide people with the best quality health care. Please email him at jimedw@shands.ufl.edu or email Kim Rose, UF Health Communications director of strategic communications, at roseka@shands.ufl.edu.